During this 32 km long tour, you can combine a bike tour with tasting regional specialties. The tour starts in Echternach and passes alternately on the Luxembourgish and on the German side of the Sûre towards Hinkel. 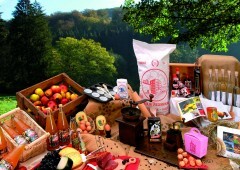 The bikers will enjoy an ample lunch with regional products in Kulturhaff Millermoler. The tour ends in Echternach.